“Devil is in the Details!! !” – Now That's Style! ← Great Fabrics used for J. Crews Ludlow Suit! Some may consider this ‘Preppy’ style, and others may say ‘Classic’ style! I just call it ‘Style’, and it’s immaculate. I just had to share this photo of my boy, my brother, Michael C Thomas Bespoke, a fantastic custom clothier from Memphis, TN. Michael is always exquisitely dressed and is truly one of my personal fashion icons, and a real master of his craft. Those of you working to ‘up your style game’, should take a close look at this ensemble, and pay close attention to the details. “Look at your jacket as the frame…The shirt is your canvas…and you paint with your neck-wear and accessories! 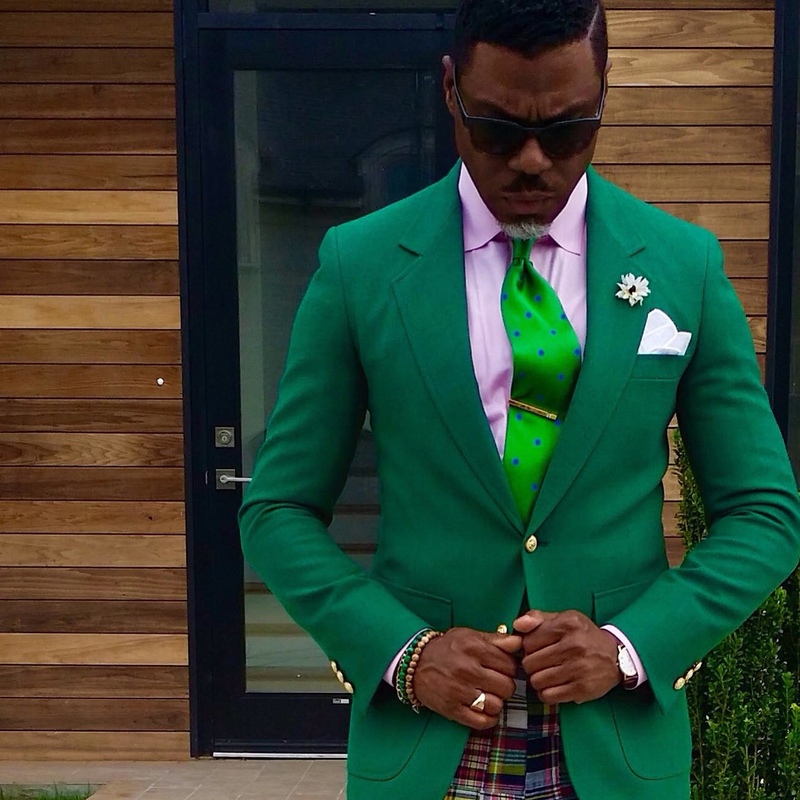 Michael C. Thomas, affectionately know as ‘The Black Lion’, has done this to perfection.” Check out his emerald-green, notched lapel blazer, with large patch-pockets and gold button details. Most importantly look at the proportion and fit. The high arm-holes and narrow sleeves accentuate his svelte build, allowing the jacket to hug him like a glove. The accents of the pale pink shirt, vibrant green neck tie, simple white-cotton pocket square, daisy boutonniere, leather banded watch, multiple layered wrist jewelry, and gold signet-ring, all help to paint a dashing picture. This brother knows what he is doing, but he should… As I said, he is a master of his craft.